Katie manages the Volunteers through Education and Service Learning Program. This includes holding volunteer orientations, scheduling and working with volunteers in the fields and greenhouse. 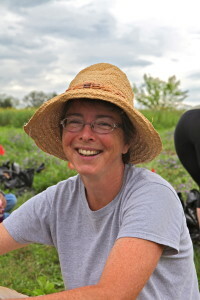 She schedules and leads volunteer service groups, and recruits and manages seasonal interns. Katie also coordinates the Grower Program. She helps set and track Grower goals, and works with Growers in the fields and greenhouse. Katie was born in Washington, DC, in a large family with a severely handicapped sister. She has lived in Damascus, MD, with her husband and family for almost 30 years. After college, she worked for the MD National Capital Park and Planning Commission in the Environmental Planning Division, and then for the MD Forest, Park and Wildlife Service as a Project Forester in Howard and Montgomery Counties. Her family helps care for her sister in their home and does advocacy on behalf of disabled people and the services they need. Katie enjoys backpacking, cooking (especially with Red Wiggler farm vegetables! ), and is trying to learn to knit.